Product prices and availability are accurate as of 2019-04-20 11:41:46 UTC and are subject to change. Any price and availability information displayed on http://www.amazon.com/ at the time of purchase will apply to the purchase of this product. According to customer feedback, this dress runs small, we suggest you can order 1 or 2 sizes up. Thanks for your kind understand. US(0-2)=Tag S---Bust: 33.9" ---Waist : 27.2"--- Length: 54.3"
US(4-6)=Tag M--- Bust: 35.8"--- Waist :29.1" ---Length: 55.5"
US(8-10)=Tag L--- Bust: 37.8"--- Waist : 31.1" ---Length: 55.9"
US(12-14)=Tag XL--- Bust: 39.8"--- Waist :33.1" ---Length: 56.7"
US(16-18)=Tag XXL--- Bust: 41.7"--- Waist:35.0"--- Length: 57.5"
US(18-20)=Tag 3XL: Bust: 43.7"--- Waist:37.0"--- Length: 57.9"
Any type of support for the chest? From the pictures they are see through over the shoulders and back. Answer: No cups inside for support. Wear a regular bra same color as the dress or get a bra with clear straps will be fine. Could it be worn as a maternity dress? Answer: Yes. The top is snug fitting but the bottom is very loose and flowing. Incredibly flattering and has plenty of room for baby belly. I'm pregnant and don't know what's my size to this dress. Answer: Well, I wear a size 18 and bought a 3X which fit comfortably with some extra room. Hope this will help you. Is it a chiffon dress? Answer: The overlay is chiffon, but lining inside is not chiffon and top is lace. Answer: The lining of the dress is not as long as the overlay. It hits below the knee. 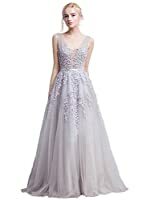 Is this dress elegant enough for a wedding guest dress? Answer: Yes, it is. Flattering and nice. Colors may appear slightly different due to computer picture resolution and monitor settings. Any questions or problem, please message us and allow 24 hour. 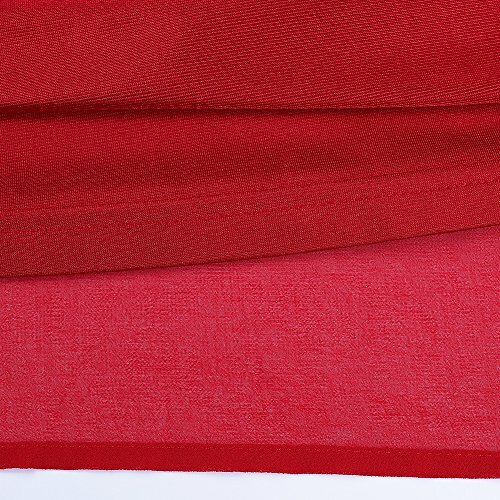 Material: 95% Polyester + 5% Spandex, lightweight and soft. We suggest go one or two size up. There's not much give in the fabric up top. Bust waist size is the most important reference for this dress. 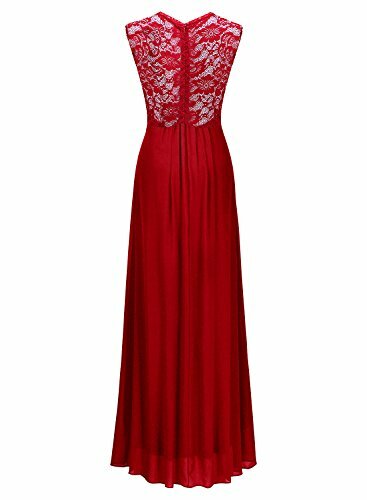 Features: Stylish V neck, empire high waist, sleeveless, a little lace around the neck area, see through lace back design, zipper back. 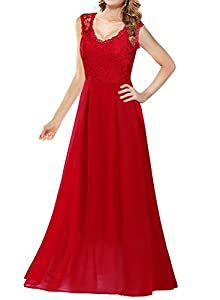 Perfect for wedding, evening prom party, balls. Also you can take it as bridesmaid maternity dress. You can pair with a beautiful belt to dress it up. 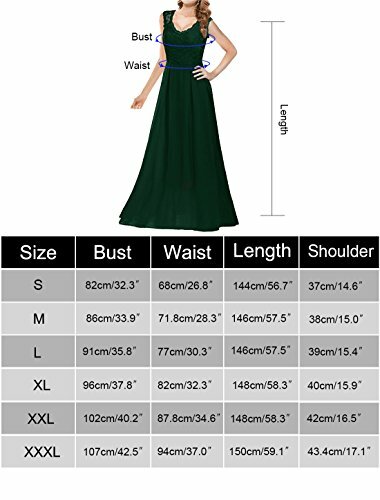 Please compare your size to the size chart listed. Be sure to look at the size chart and not the Amazon size chart.